Emmet Dalton’s scandalous career of thievery cemented his status in American Old West history. In this autobiography, he candidly describes his days as an outlaw and gang member. Incidents include the ill-fated raid in Coffeyville, Kansas—the deadly shootout that left Dalton with more than twenty gunshot wounds and a life sentence in the Kansas State Penitentiary. The book also provides a peek into the outlaw’s personal life. Dalton reminisces about his adolescence, recalls brief visits to his mother, and discusses his relationship with Julia Johnson—the woman who eventually became his wife. 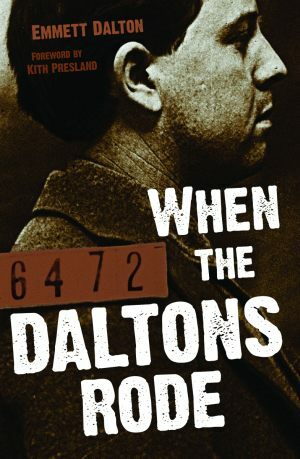 While he served time in prison, Dalton looked back on his crime-filled life and shared his reflections. Born on May 3, 1871, Emmett Dalton became a robber, an outlaw, and a prisoner, until he passed away on July 13, 1937. In addition to starring in a movie based on his life, he capitalized on his colorful life by writing Beyond the Law and When the Daltons Rode. An expert on Emmett Dalton, Kith Presland has visited Coffeyville as a special guest and been interviewed for the Coffeyville Journal. She graduated from Sparsholt College and lives in Reading, England.